There is much debate over whether or not protesting has any real effect on social change. Can you blame anyone? Walking for miles with picket signs and yelling until your lungs grow raspy does not seem like the most efficient way to get a point across. Plus, there are sometimes a few who ruin it for the many and bring about an extremely negative, violent atmosphere. When you consider all of the factors, it doesn’t seem like the most effective of methods. Even so, protesting is one of the most important elements of freedom of speech. It brings attention to a cause, making it more humane by bringing people who feel strongly about an issue to the streets. Protesting puts faces to a cause. It shows the world who is truly being affected, and it’s not just adults. Parents often bring their children to such events to show that societal and political changes affect every generation. Power to the people no matter what age, am I right? When a rally occurs, people know. The media know. Bystanders notice. Even politicians are aware. If executed correctly, protesting may even encourage outsiders to look at the issue in a different way. Protests are not intended to persuade, but they encourage change and invite people to challenge their morals. Protesting can bring about a sense of power. Speaking from experience, I participated in an anti-police brutality rally during the summer of 2016. There was something about taking over the streets with my sign and chanting as loud as I could that made me feel dignified. We turned heads, got people talking and made it on the news. As a group, we were stronger together. It was so moving to be surrounded by others who felt just as empowered as I did. Mind you, not everyone supported that particular cause. No single person you meet will have the exact same views as you. Not everyone is going to agree with your opinions, and that’s completely okay. Therefore, it was much more of a personal experience. I did it for me. Some of the largest protests have occurred recently. The Women’s March which happened shortly after Trump’s inauguration had some of the largest turnouts. News outlets reported between three and five million people around the country participated in the protest. There were even sister marches in other countries. The power of protesting can reach areas far and wide. One of those particular marches took place in Cleveland, Ohio. Bree Morgan, a nursing student at Kent State, attended the rally. “I wanted to be a part of the right side of history and also something where the intentions were to demonstrate the resistance and advocacy of people who support human rights,” Morgan said. 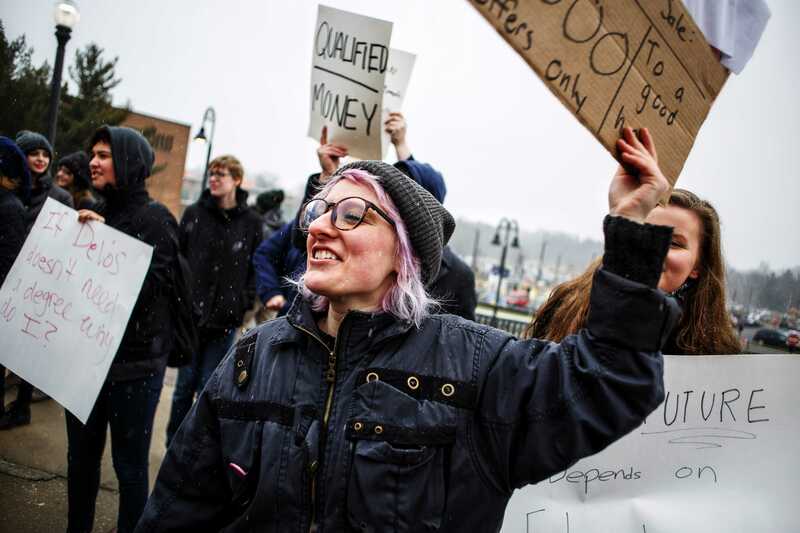 Clare Goebel, an ASL interpreting and political science major at Kent State, has participated in a few marches and solidarity protests. “I was raised to look past my own privilege to understand that other people have different thought processes and different lifestyles. For me, it never made sense to prejudge someone based on skin, color, sexual preferences, or else that makes them different than the mainstream person,” Goebel said. Protesting assists in keeping people engaged. It inspires societal change and encourages the advancement of human rights. It keeps citizens informed and provides for a more activist mindset. It can seem like your voice is not enough. You might think that there are influential people making a difference in politics and society and you can’t be one of them. Well, I’m here to tell you that you’re wrong. Change does not happen overnight, but that doesn’t mean you can’t play an equal part in making a mark on society. No one else can do that for you; you are the only person who can contribute your own ideas, concepts and values to an issue. The world needs to know what you have to say. Don’t let yourself be quieted; let yourself be heard.